So there I am at Granville Island. And there’s a big lump of BC Wild Octopus just sitting there. I’ve never cooked anything other than baby octopus (stir fried quickly with garlic, butter, and wine). I had no idea how to cook an entire octopus, let alone the single big tentacle I was planning on buying. But, I did have many fond memories of various “polpo” dishes in Barcelona, like this Polpo a la Gallicia – soft boiled potatoes with tender discs of octopus tentacle with a dusting of paprika. So I buy a tentacle; almost one and a half pounds, and (as it turns out) just about the right amount for two people. Back at home, a quick web search leads me to a great Greek recipe for grilled octopus at kalofagas.ca. I braised the tentacle for about 30 minutes over medium heat with the lid on, adding a little bit more water as needed. Here is what it looked like before turning the heat down (just before adding some more water). You can see how much it has shrunk already, and the red liquid in the pot. That colouration is from the octopus itself. I placed these chunks into a pan, added olive oil, a couple of chopped garlic cloves, and a spoonful or two of the braising liquid. I then placed my gas stove on broil and placed the pan in the broiling rack. I left it in for about 15 – 20 minutes, stirring the pan several times to coat the octopus in oil and making sure the garlic chunks didn’t go beyond dark brown. The tentacle bits were nicely crisped along the edges. I plated it with boiled yukon gold potatoes and a side of broccolini with lemon wedges. The lemon goes great over everything on the plate. There was still a bit of chew to the octopus – not sure if I should have done smaller chunks, braised it longer, or what. The flavour was tasty and fresh balanced with the crispness and the toasted garlic. Cooking octopus turns out to be easy, and the end results are delicious. I’d like to give it another try with a whole octopus and actual grilling rather than just my oven broiler. Well-timed. I pulled some squid out of the freezer this past weekend and grilled it per Ronnie Shewchuk’s recipe for calamari in BBQ Secrets Deluxe. It was the one we did at BBQ Bootcamp. Started with a salt rinse, then one hour of marinating in olive oil, chili flakes and garlic. Served with tomato and basil more olive oil and a little vinegar, salt and pepper. No reason you couldn’t do the same with the octopus – maybe cutting it up before marinating and then treating it the same way – or is the braising necessary to break down the chewiness? The blog post of Owen’s that Degan linked to highlights a bunch more ingredients in the braise, which is definitely doable. The octopus is already filled with salt, so I don’t think that step is needed. 1. Make sure you have boiling water to the max. 2. 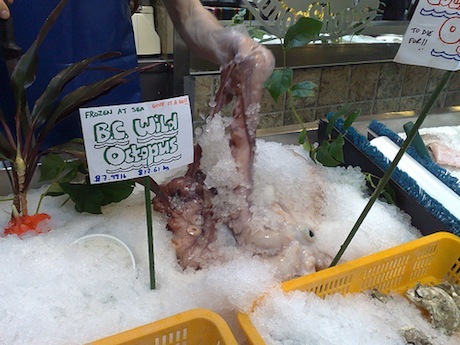 Submerge the Octopus into boiling water three times. That is push it down (tongs help) once then take out and wait a few seconds until water is boiling again and repeat twice more. 4. Add octopus and simmer at low heat for at least 45 minutes (depending on the size). Check with a toothpick or fork it should be soft at the thickest area. If not leave it up to 1 hour and keep checking. 5. For final preparation its your choice, though I really like your Pulpo a la Gallega recipe. I learned to cook octopus like this in Spain and it works every time.